Plans for “serious” writing while traveling, as usual, were reduced to scribbling notes and promising (to myself) to compose a diary of our trip from memory (and notes) once home. The current plan is to organize my diary thematically, rather than chronologically. Over the next several days I’ll begin by writing about our food experiences. 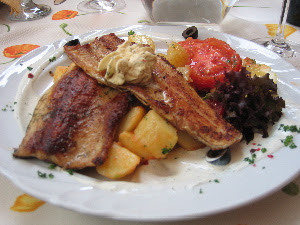 Here, to whet the appetite, is a photo of our dinner in Eger, Hungary: pisztrangfile, or brook trout, a staple of the Hungarian diet, chosen in honor of our good friends the Pistrangs, who may or may not be descended from trout.